Hotels Fairy is a FREE service to save you money. We never add any fees or commissions. A Fabulous Stag Party On A Tight Budget, We Have You Covered! 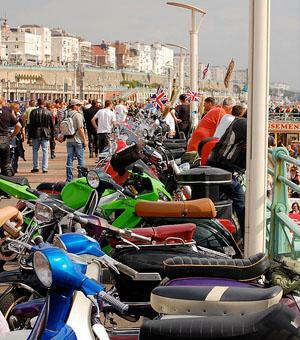 Motorcycle touring in the UK can be a great way to take an interesting vacation, see lots of new places, and enjoy some of the best small town destinations and beautiful scenery in the UK. While you may want to carry a combination of a bit of cash, traveler’s checks, and a credit card, it’s important to have at least one credit card option for your trip. Leave your debit card at home, since it doesn’t come with the innate protection of a credit card, especially if you’re a victim of theft while you’re on the road. If you don’t already have a credit card, apply for a low-interest card with a reasonable limit. This could also act as your “emergency fund” in case your motorcycle needs service when you’re on the road in the UK. Before you leave, contact your credit card company to let them know you’ll be traveling in the UK. Some companies will automatically shut down your card at the first sign of a charge from a foreign country, assuming that your card has been stolen. By alerting your credit card company, you can avoid this problem so that you can use your card whenever you need to on your trip. If you’re taking your own motorcycle on your touring trip, have it thoroughly serviced before you leave. If it breaks down on the road, you’re likely to get stuck for days near the shop that can service it, which can ruin an entire trip. Also, bring basic maintenance supplies, such as extra bulbs and oil, with you on your trip. How you pack for your trip will depend on what time of year you’ll be traveling. Remember that the climate in the UK is milder than that of most American regions, so plan for cool weather even if you’re traveling in the summer. The best way to pack is to include several layers and mix-and-match outfits that will work for different situations – both riding your motorcycle and possibly walking into some nicer restaurants and museums on the way. Packing clothing that you can layer will help you prepare for any weather. Also, make sure you’re always prepared for rain, since it can rain in any season in the UK. Don’t try to travel too far in a day. You want to enjoy time on your motorcycle enjoying the scenery, but you also want to have time to relax each day. Travel to some interesting spots. There are plenty of backwoods villages in the UK where you can find a decent place to eat and sleep, but you may get bored if those are the only places you stay on your trip. Spend some time also traveling to interesting locations that have historical sites, museums, or nightlife you can enjoy. Keep your budget in mind. There are some places in the UK where you can pitch a tent by the side of the road if you need to save some money. If this isn’t an option for you, consider splitting your trip between more expensive large towns and cities and smaller towns that provide bed and breakfast or inn accommodations. Leave some extra flexibility in your itinerary, as well. Don’t leave yourself a two-hour window within which you have to get to the airport or risk missing your flight, for instance, or you’ll simply stress about staying on schedule for the whole tour. Exmoor National Park Tour: For a tour like this, you could start out in Bridgewater and essentially tour around Exmoor National part and back, in a large circle. Stops could include Wembdon, Fiddington, Dunster, Alcombe, Minehead, Porlock, and Taunton. This tour focuses more on the natural beauty surrounding the park and less on tourist and historical attractions. Irish Circuit: One of the great parts about motorcycle touring in the UK is that you can see an entire portion of the country in one trip. Of course, you can’t take in everything, but a week in Ireland is enough to see many of the country’s natural and historic beauties. A tour around Ireland might include a stop at Bantry on the southwest Irish coast, a stop at Galway, where you’ll find lots of Irish culture in a cosmopolitan setting, and a stop at Enniscorthy, where you’ll see the peat bogs and agricultural farmsteads of the south. Lake District Tour: You can take a tour of England’s gorgeous Lake District in just a weekend. This could be a very relaxing tour, and if you decided to make it longer, you could shorten your trips and do a bit more sightseeing in between rides. A Lake District tour should definitely include stops at Windermere, Honister Pass, and The Dales. Jamie Scott contributed this article. Jamie is preparing for a motorcycle tour in the UK which can be exciting and almost as fun as actually taking the trip. These easy preparation steps will help you get ready for your trip and have more fun while you’re touring.